Judson Graves, a longtime partner with the international law firm Alston & Bird, has been appointed interim dean of Emory University School of Law, effective Aug. 1. Graves, a nationally recognized jury trial lawyer and fellow of the American College of Trial Lawyers, is a 1975 graduate of Emory Law and an adjunct faculty member at the school. He retired from Alston & Bird’s Atlanta office in 2013. “I’m looking forward to working with Judson Graves, and I’m especially excited about engaging Emory Law faculty, staff, students, alumni and friends as we work together to anticipate and plan the next chapter of the school’s national and international leadership role in legal education,” says Dwight A. McBride, who will begin his tenure as Emory’s provost and executive vice president for academic affairs on July 1. 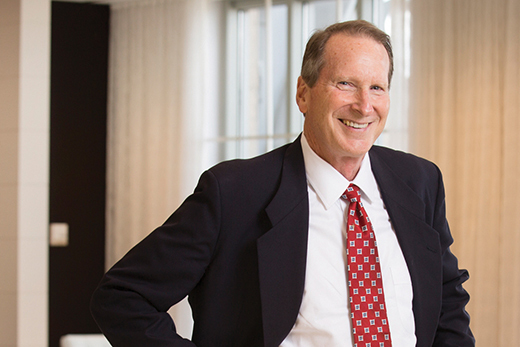 During his nearly 40 years with Alston & Bird, Graves was a member of the firm’s Products Liability Group, served as a practice group leader, was co-chair of the firm’s Adversarial Practice Groups, and chair of the firm’s Pro Bono Committee. His focus of practice was on civil jury trial work in complex cases in state and federal courts, especially in the areas of products liability, medical malpractice, defamation and intellectual property. Graves remains actively involved at Alston & Bird, where he leads a nationwide trial practice training program he created for the firm’s litigation associates. Graves has tried more than 100 jury cases to verdict. He was profiled in 2000 in The National Law Journal’s annual feature “Winning,” as one of 10 top trial lawyers in the United States. In 2009, Best Lawyers named him as one of three “Lawyers of the Year” in Georgia. A U.S. Navy veteran, Graves served from 1969-1972 as a lieutenant and weapons officer on the USS McCaffery. He holds an undergraduate degree from Dartmouth College. As a student at Emory Law, Graves was assistant articles editor of the Emory Law Journal, a member of the Order of the Coif, and graduated with distinction. As an adjunct faculty member, Graves taught Advanced Civil Trial Practice multiple years, as well as participating in Emory Law’s Kessler-Eidson Program for Trial Techniques. He plans to teach in the Pre-Trial Litigation course this fall.